Jordan first put his 33,000-square-foot home near Chicago on sale in March 2012 for $29 million. Michael Jordan has lowered the price on his art deco mansion to $16 million, nearly two years after first trying to sell it for nearly twice that amount. The house is on seven-plus acres in Highland Park, Ill., about 25 miles north of Chicago. The former NBA star first put it on the market in March 2012 for $29 million. The price was cut to $21 million nearly a year ago and then failed to sell at auction last month, when nobody made even the $13 million minimum bid. The house was built in 1995 and has nine bedrooms, 15 baths, a cigar room, and a garage big enough to hold 14 cars. There's a huge home gym. Katherine Malkin, the listing agent, said the most awesome home feature is the regulation sized basketball court. "There's nobody -- man, woman or child -- who walks on the court who is not stunned by it," she said. "The lighting, the floor, everything is so beautiful." With the court and finished lower level of the house included, the compound totals about 56,000 square feet. Outdoors is a chipping range and putting green, tennis courts, a lily pond and a huge flagstone patio. 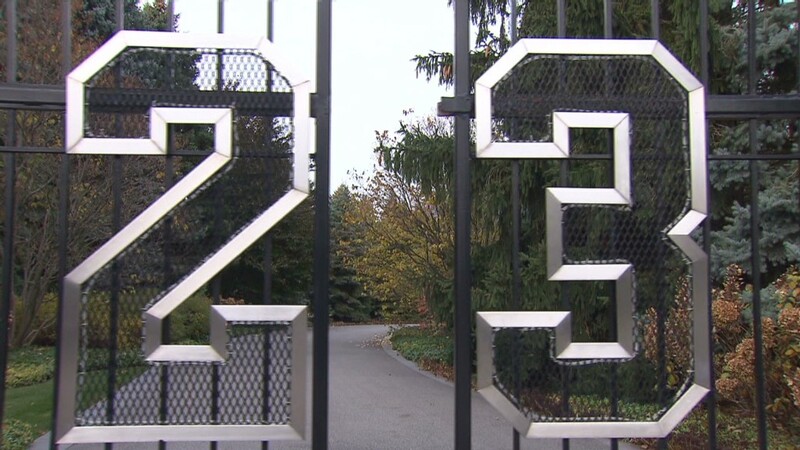 The front entrance gate sports a giant number 23 -- not for the address but, of course, for Jordan's former number. Malkin has had the listing for about a year and said there has been lots of interest in it, but few prospects qualify as serious buyers. Would-be purchasers must have enough liquidity to pay cash for the house in full before they can put in offers. Last year, Jordan bought a house in his native North Carolina, one close to the home court of the Charlotte Bobcats, the NBA team of which he is now the majority owner. The Illinois property is about three times larger than the new house and stands out in the neighborhood for its size and price. "He was a very successful and sought-after personality and he built a compound to fit his lifestyle," said Malkin. She said he has redone parts of the property over the years and it's in "perfect" condition. "Nobody kept a house better than he did," she said.